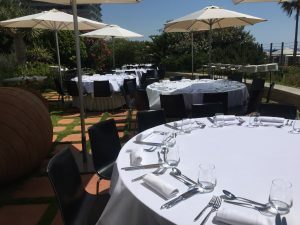 Are you looking to host an event in Barcelona for a large group? Don’t know where to start with the search process? Here at Akommo we’re all expats, so we know how it feels to deal with planning an event in a different country. In our industry, location really is everything. 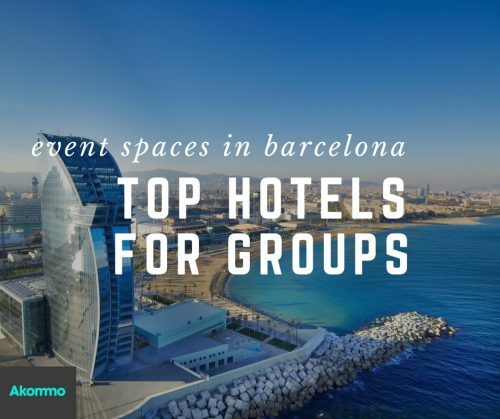 We’re going to share the best event spaces Barcelona has to offer for hotels, based on design, capacity, and location. We have long-standing relationships with these hotels, and can guarantee the best rates for your next corporate event. We’ve saved clients thousands of euros and countless hours of negotiating and organising to make their large group event one to remember. 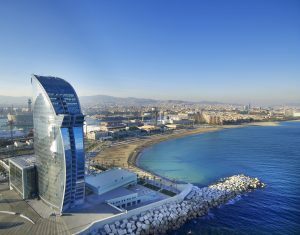 One of the most emblematic hotels in Barcelona, the W Hotel offers some of the most breathtaking waterfront view. The amenities, supreme service and obviously capacity, exceed expectations. Did we mention the sea views? They have 473 rooms and meeting spaces for up up to 1000 people, and some of the trendiest nightlife venues. Continuing down the beach promenade, you’ll find the spectacular Pullman Skipper Hotel. The incredible seafront location makes this hotel the perfect spot to host your next large group event. They have 241 comfortable bedrooms, as well as two pools and a spa. Their largest meeting space can hold up to 800 people, and not to mention their breathtaking multi-level interior terrace. In June we hosted a major annual event with our multinational clients here. 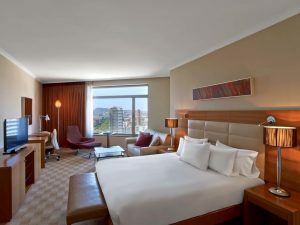 The 483 rooms are absolutely breathtaking, and they offer spectacular city and sea views. As for conferences, the 1,000sqm of meeting space can meet your every need for large events. Our client was definitely pleased with their event this year! 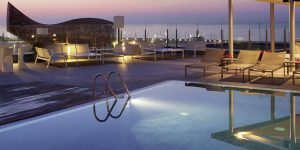 Many people know this hotel for its proximity to the famous Camp Nou FCB Stadium, and for hosting many famous football players. Recently this hotel is receiving amazing press reviews about their delicious kitchen. They offer 55,000 sqm of exclusive garden space! This is definitely an urban oasis in Barcelona that cannot be missed. Is there anyone who isn’t familiar with the world-renowned Hilton brand? They offer up to 1,800 sqm of meeting space, and up to 433 hotel rooms. The Puro Beach Club, frequented by tourists and locals alike is a major hotspot in this city for deep house parties and poolside chill out sessions. Though it is only 4-stars, in our opinion the service, amenities, and location of the hotel speaks for itself. Feel like you could use more help to plan your next event? Contact us today and we’ll help with your venue search free of charge!